Fountain Pens Are Good For You! 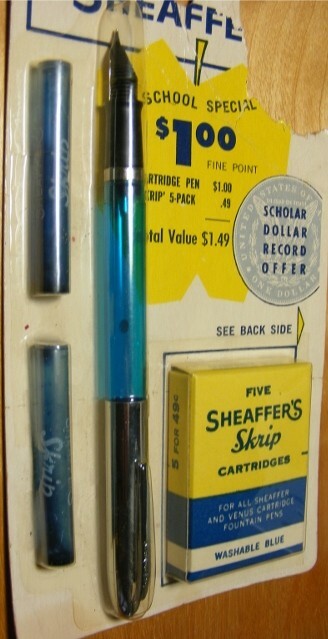 Sheaffer Student Pen Value Pack; Note The Translucent Blue Barrel. Growing up in the 1950s and ’60s, I was a fountain pen user. 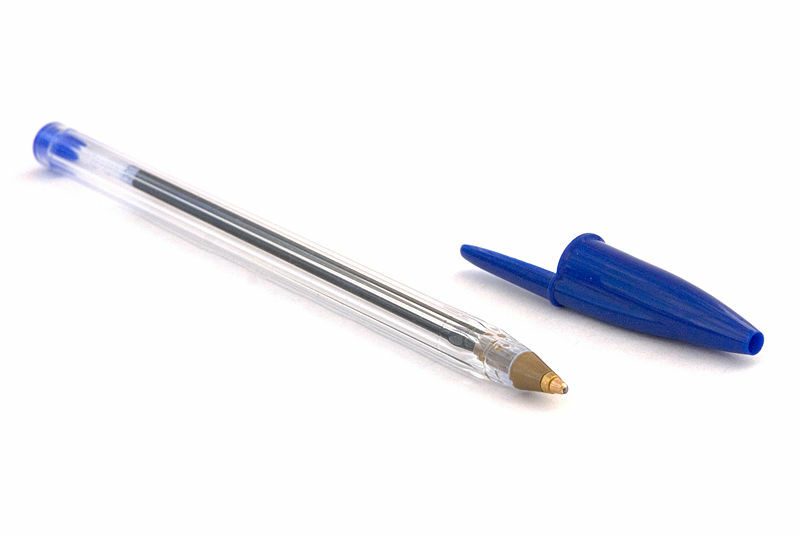 I can remember the very first ballpoint pens I ever saw, when I was in the first grade (1958 or so) living in Pascagoula, Mississippi. The drug store nearest our school was giving away cheap plastic ballpoint pens from a box that was big enough to hold thousands. Like my classmates, I scurried in, grabbed a handful, and ran to school. 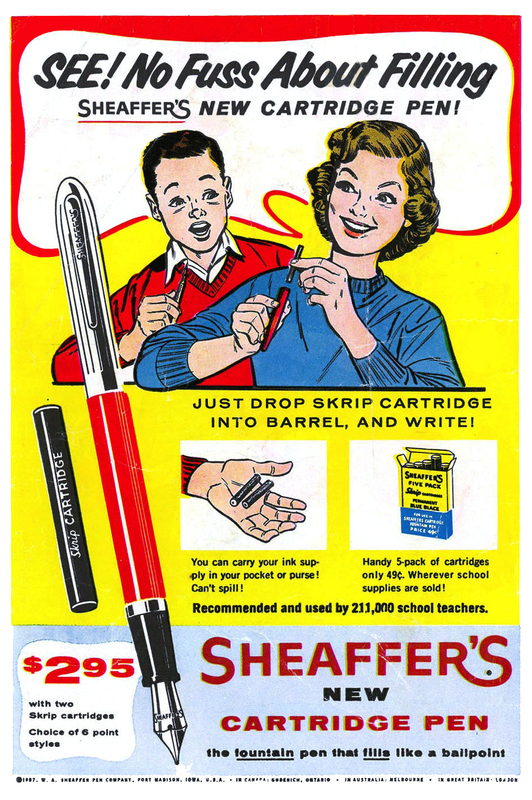 I remember snagging six pens that day, and not one of them worked. Giveaway Ballpoints; My Grandmother Loved Using These!!! Later, when I saw the Bic ballpoint pens, I was much more favorably impressed. Those pens were cheap, non-refillable throwaways, but they worked perfectly and were good value. I seem to recall that they cost 19¢. If you took the blue plug out of the back end and sucked on the tube barrel, you’d get a mouthful of blue ink; I learned that the hard way. 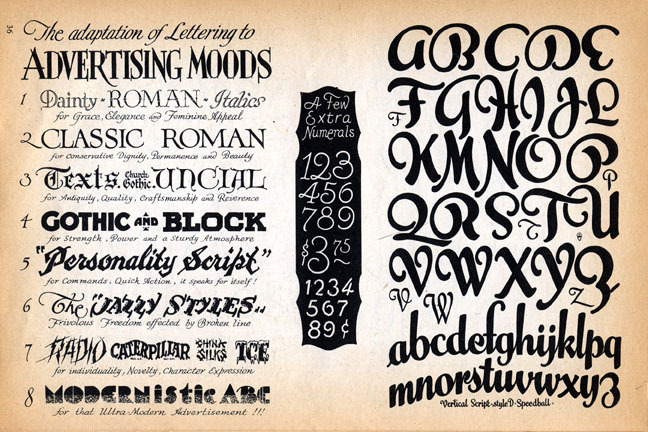 I much preferred my fountain pens, as I was a constant doodler, and fountain pens were better– for me– to draw with. 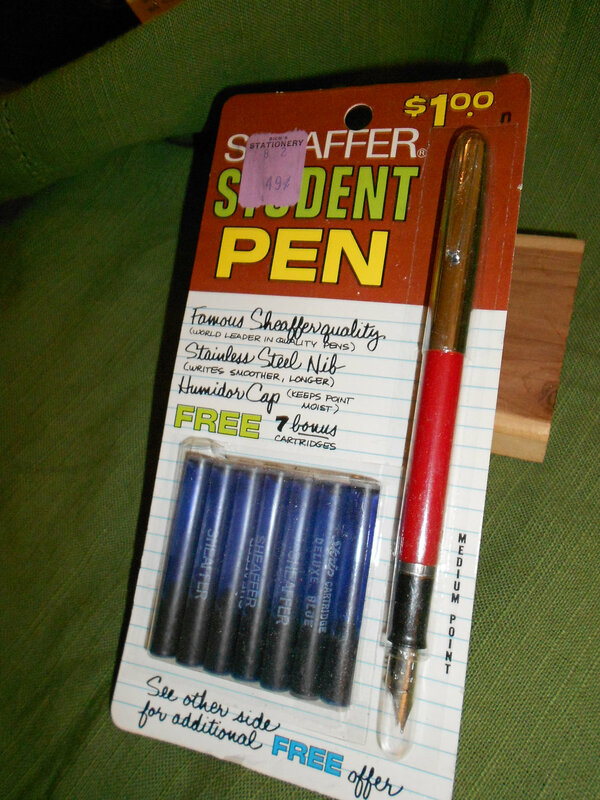 The fountain pens I used back then, and all through high school, were the cheap Sheaffer fountain pens you could get for a buck or so. They used ink cartridges and worked fine. I liked the medium-point nibs on mine. A few ballpoints crossed my path. I tried a Parker ballpoint, shown here. I still have it. I liked it fine for a ballpoint but went back to my cheap fountain pens. Like every kid in America, I received a Cross ballpoint pen and mechanical pencil set for my high-school graduation. Hated ’em. The pen wrote in a scratchy fashion and the pencil was crap. 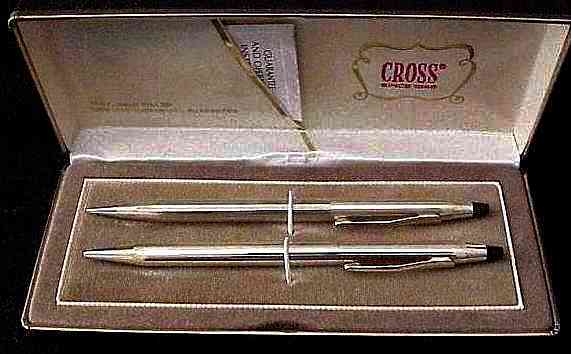 Cross Pens Made Me Cross! For art, I used dip pens with Speedball and Hunt nibs using Higgins India Ink from a bottle, or Rapidographs or Leroy technical, which used cartridges and had nibs in a variety of point sizes. Those pens using India Ink had to be cleaned the second you were done with them or the dried ink was extremely difficult to clean off. 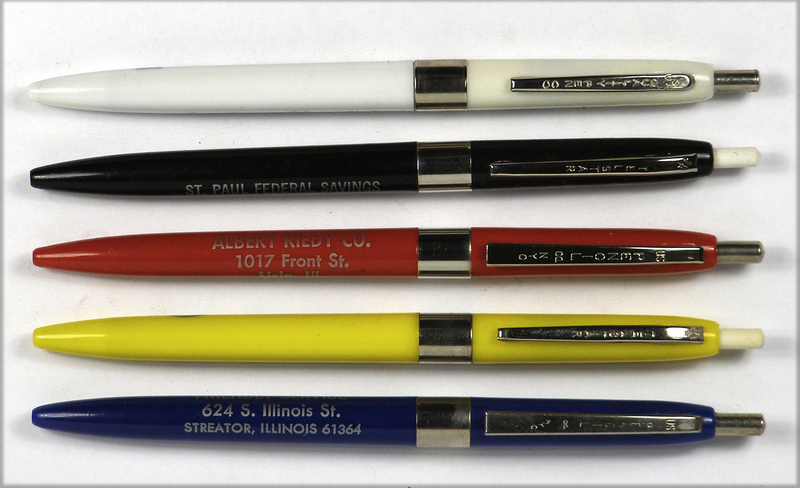 I still have a fishing tackle box from college days filled with these dip pens and nibs. It’s Easy To Do This With A Speedball Pen; yeah, right! When all is said and done, I still prefer fountain pens. My current favorite is a Parker silver-crosshatched Sonnet with a medium nib, which looks a lot like my old Parker 75, but there are several brands in my mahogany pen box and part of the fun of fountain pens is using different pens and inks depending on the mood you’re in on a given day! 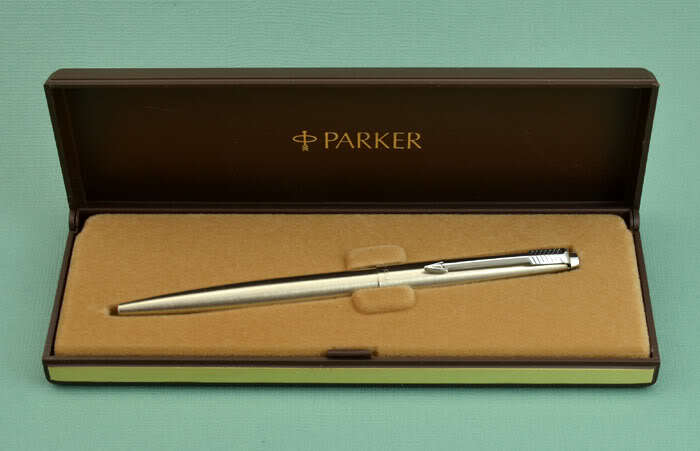 Parker calls this silver crosshatch style “cisele,” which is a French term for having a chiselled appearance. Kenneth Parker, president of Parker Pens back in the early 1960s, had a cigarette case with this silver grid pattern, liked it, and decided it would be perfect for the Parker 75 they introduced in 1963. It is a snazzy-looking finish!